Guns and knives aren’t the only objects that can be used to kill someone. Sometimes death shows up in the least likely scenarios. All that is left now is for Jamie to attempt to figure out who did it and why this individual resorted to using a didgeridoo. Jamie is an intelligent, likeable narrator whose unique point of view as the cousin of the accused adds a poignant twist to this tale. Her quirks are slowly revealed as the plot progresses and they add depth to her character. It was especially intriguing to see how the parts of her personality that were the opposite of what I’d expect to see from a lawyer come into play as the plot thickens. Pacing issues and multiple, off-topic segues about food were the main reasons why I gave this novella three stars. The story starts off with a strong opening scene only to be hijacked by background information that appears to be irrelevant to current events. Other sections waver between attempting to solve the murder and discussing topics that are much more cheerful than I would expect to find mixed in with an otherwise dark premise. I was completely unfamiliar with this series when I started reading, but it was easy to get caught up on what Jamie’s life was like before this mystery began. She has a sharp eye for detail and seems to really enjoy her work. This can definitely be read as a stand-alone book, although I am curious to see how Jamie might change as an individual on future adventures based on everything she experienced during the course of this one. 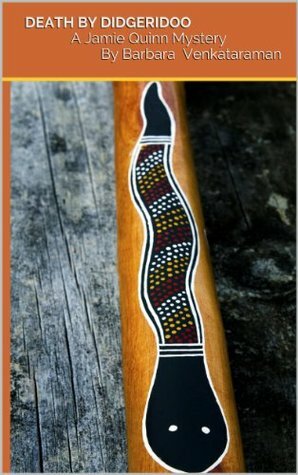 Death by Didgeridoo is a good choice for anyone is in the mood for a lighthearted murder mystery. I would particularly recommend this book as a stepping stone into the genre for new readers who aren’t interested in the grittier aspects of crime-solving.